Transdermal administration of drugs is generally limited by the barrier function of the skin. Vesicular systems are one of the most controversial methods for transdermal delivery of active substances. The interest in designing transdermal delivery systems was relaunched after the discovery of elastic vesicles like transferosomes, ethosomes, cubosomes, phytosomes, etc. This paper presents the composition, mechanisms of penetration, manufacturing and characterization methods of transferosomes as transdermal delivery systems of active substances. For a drug to be absorbed and distributed into organs and tissues and eliminated from the body, it must pass through one or more biological membranes/barriers at various locations. Such a movement of drug across the membrane is called as drug transport. For the drugs to be delivered to the body, they should cross the membranous barrier. The concept of these delivery systems was designed in an attempt to concentrate the drug in the tissues of interest, while reducing the amount of drug in the remaining tissues. Hence, surrounding tissues are not affected by the drug. In addition, loss of drug does not happen due to localization of drug, leading to get maximum efficacy of the medication. Therefore, the phospholipid based carrier systems are of considerable interest in this era. Liposomes and niosomes are the vesicular carrier systems which have received a lot of attention over the last decades as a means of transdermal drug delivery. Researchers have understood the properties of vesicles structures for use in better drug delivery within their cavities, which would to tag the vesicles for cell specificity. The reason for using vesicles in transdermal drug delivery is based on the fact that they act as drug carriers to deliver entrapped drug molecules across the skin, as well as penetration enhancers because of their composition. In addition, these vesicles serve as a depot for the sustained release of active compounds in the case of topical formulations, as well as rate limiting membrane barrier for the modulation of systemic absorption in the case of transdermal formulations. The vesicles have been well known for their importance in cellular communication and particle transportation for many years. They are not suitable for transdermal delivery because they cannot reach the deeper layers of the skin as they are trapped in the superior layers of stratum corneum. A new vesicular derivative, the "transferosomes", has paved the way to minimize the defective transdermal permeation of a number of low and high molecular weight drugs,  which has been found to be one of the major advancement in vesicle research. Transferosomes are a special type of liposomes, consisting of phosphatidylcholine and an edge activator. They are soft malleable vesicles tailored for enhanced delivery of active agents. They are registered by a German company IDEA AG and used by it to refer to its proprietary drug delivery technology. The name means 'carrying body' and is derived from the Latin word 'transfere' meaning 'to carry across' and the Greek word 'soma' for a 'body'. [Figure 1] describes the structure of a transferosome. A transferosome carrier is an artificial vesicle designed to be like a cell vesicle or a cell engaged in exocytosis and thus suitable for controlled and potentially targeted drug delivery. Transferosome is a highly adaptable, stress responsive, complex aggregate. Its preferred form is an ultra-deformable vesicle possessing an aqueous core surrounded by the complex lipid bilayer. Interdependency of local composition and shape of the bilayer makes the vesicle both self regulating and self optimizing. This enables the transferosomes to cross various transport barriers efficiently and then act as a drug carrier for non-invasive targeted drug delivery and sustained release of therapeutic agents. One of the most controversial methods for drug transport across the skin is the use of vesicle formulation as skin delivery systems. Transferosomes possess an infrastructure consisting of hydrophobic and hydrophilic moieties together and as a result can accommodate drug molecules with a wide range of solubility. Transferosomes can deform and pass through narrow constriction (from 5 to 10 times less than their own diameter) without measurable loss. , This high deformability gives better penetration of intact vesicles. Transferosomes are self aggregates, with an ultra flexible membrane which delivers the drug reproducibly into or through the skin. These vesicular vesicles are several orders of magnitude more elastic than the standard liposomes. Transferosomes overcome the skin penetration difficulty by squeezing themselves along the intracellular sealing lipids of the stratum corneum. The concept of transferosomes as a carrier for transdermal delivery was first developed by Cevc and coworkers, in 1992. Since then, many investigations have been carried out on transferosomes and their possible application as drug carriers. Delivery of peptides by transferosomes provides a very successful means for the non-invasive therapeutic use of large molecular weight drugs like insulin on the skin. Hafer et al. studied the formulation of interleukin 2 and interferon a containing transferosomes for potential transdermal application. They are biocompatible and biodegradable as they are made from natural phospholipids similar to liposomes. They have high entrapment efficiency, which is nearly 90% in the case of lipophilic drug. They protect the encapsulated drug from metabolic degradation. , They act as depot, releasing their contents slowly and gradually. They can be used for both systemic as well as topical delivery of drugs. Thus, the complex lipid molecules, transferosomes, can increase the transdermal flux, prolong the release and improve the site specificity of bioactive molecules. A transferosome is a self-adaptable and optimized mixed lipid aggregate. The surfactant molecules act as "edge activators", conferring ultra deformability on the transferosomes, which reportedly allows them to squeeze through channels in the stratum corneum that are less than one-tenth the diameter of the transferosome. According to their inventors, where liposomes are too large to pass through pores of less than 50 nm in size, transferosomes up to 500 nm can squeeze through to penetrate the stratum corneum barrier spontaneously. They suggest that the driving force for penetration into the skin is the "transdermal gradient" caused by the difference in water content between the relatively dehydrated skin surface (approximately 20% water) and the aqueous viable epidermis (close to 100%). Deformability of transferosomes is achieved by using surface active agent in the proper ratio. The concentration of surface active agent is crucial in the formulation of transferosomes because at sublytic concentration these agents provide flexibility to vesicle membranes and at higher concentration cause destruction of vesicles. The resulting flexibility of transferosomal membrane minimizes the risk of complete vesicle rupture in the skin and allows the ultra deformable transferosomes to change their membrane composition locally and reversibly, when they are pressed against or attracted into a narrow pore. This dramatically lowers the energetic cost of membrane deformation and permits the resulting highly flexible particles first to enter and then pass through the pores rapidly and efficiently. The carrier aggregate is composed of at least one amphiphat (such as phosphatidylcholine)  which in aqueous solvent self resembles into lipid bilayer that closes into a simple lipid vesicle. By addition of at least one bilayer softening component (such as a biocompatible surfactant or an amphiphilic drug), lipid bilayer flexibility and permeation are greatly increased. Thus, by optimizing the resulting flexibility and permeability, the transferosome vesicles can adapt to their ambient shape easily and rapidly. Thus, they can also adjust the local concentration of each bilayer component to the local stress experienced by the bilayer. The basic organization of these vesicles is broadly similar to liposomes. But the transferosomes differ from the conventional vesicles primarily by their softer, more deformable, and better adjustable artificial membrane. Transferosomes act as drug vectors, remaining intact after entering the skin. Transferosomes act as penetration enhancers, disrupting the highly organized intercellular lipids from stratum corneum, and therefore facilitating the drug molecule penetration in and across the stratum corneum. Transferosomes are chemically unstable because of their predisposition to oxidative degradation. Purity of natural phospholipids is another criterion militating against adoption of transferosomes as drug delivery vehicles. Transferosome formulations are expensive. The drug entrapment efficiency by transferosomes can be measured by the ultracentrifugation technique. Vesicle stability can be determined by assessing the size and structure of the vesicles over time, and drug content can be quantified by high performance liquid chromatography (HPLC) or Spectrophotometric methods. Flow = Area × (Barrier) Permeability × (Trans-barrier) force. Therefore, the chemically driven lipid flow across the skin always decreases dramatically when lipid solution is replaced by some amount of lipids in a suspension. The use of the transdermal route has been well established in the past, and because of its inherent advantages, new methods for transdermal delivery are continuously being developed. The introduction of ultradeformable vesicles, transferosomes, will thus surely become an important step in relaunching the researches regarding the use of vesicles as transdermal drug delivery systems. 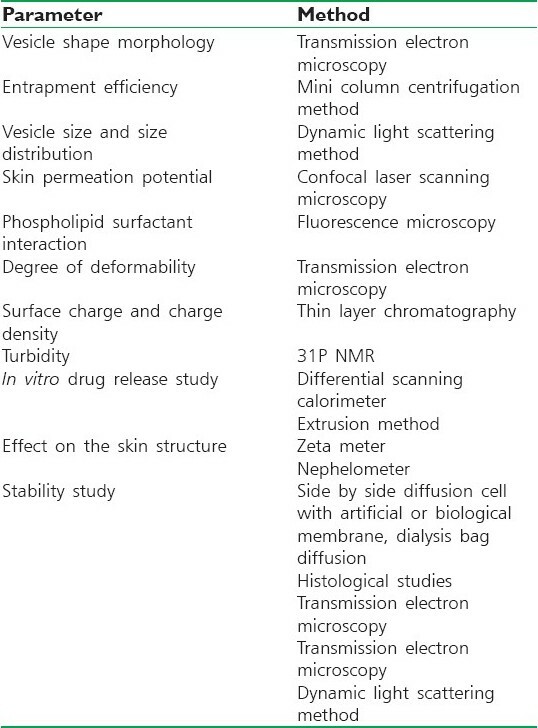 In comparison to other transdermal delivery systems, the use of elastic vesicles has certain advantages: They allow enhanced permeation of drug through skin; their composition is safe and the components are approved for pharmaceutical and cosmetic use; they can increase the transdermal flux, prolonging the release and improving the site specificity of bioactive molecules; they can accommodate drug molecules with a wide range of solubility. Hence, enhanced delivery of bioactive molecules through the skin by means of an ultradeformable vesicular carrier opens new challenges and opportunities for the development of novel improved therapies. Thus, it could be concluded that the new ultra flexible drug carrier (transferosome) can overcome all the problems associated with the transdermal delivery as transferosomes itself are specially optimized vesicles having the capability of responding to an external stress by rapid and energetically inexpensive shape transformations. The high tolerability and efficiency of these vesicular systems open vast potential therapeutic uses. These nanocarriers might offer advanced local and systemic new therapies with agents that are unable to efficiently penetrate the stratum corneum via passive diffusion. The non steroidal anti-inflammatory drug (NSAID), ketoprofen, in a transferosome formulation gained marketing approval by the Swiss regulatory agency (SwissMedic). The product is expected to be marketed under the trademark Diractin. Further therapeutic products based on the transferosome technology, according to IDEA AG, are in clinical development. 1. Vyas SP, Khar RK. Targeted and controlled drug delivery. 1st Ed Delhi: CBS Publishers; 2002. p. 219-43. 2. Jain S, Umamaheshwari RB, Bhadra D, Jain NK. Ethosomes: A novel vesicular carrier for enhanced transdermal delivery of an anti-HIV agent. Indian J Pharm Sci 2004;66:72-81. 3. Kumar R, Philip A. Modified Transdermal Technologies: Breaking the barriers of drug permeation via skin. Trop J Pharm Res 2007;6:633-44. 4. Chien YW. Logics of transdermal controlled drug administration. Drug Dev Ind Pharm 1983;9:497-520. 5. Nandha A, Nandha S, Dhall M, Rao R. Transferosomes: A novel Ultra deformable vesicular carrier for transdermal drug delivery. Pharma Info Net, October 2005. p. 395. 6. Cevc G. Drug delivery across the skin. Exp Opin Investig Drugs 1997;6:1887-973. 7. Langer R. Transdermal drug delivery: Past progress, current status, and future prospects. Adv Drug Deliv Rev 2004;56:557-8. 8. Cevc G, Blume G. New, highly efficient formulation of diclofenac for the topical, transdermal administration in ultra-deformable drug carriers. Transfersomes Biochem Biophys Acta 2001;1514:191-205. 9. Jain NK. Advances in controlled and novel drug delivery. Vol. 1 426-51. 10. 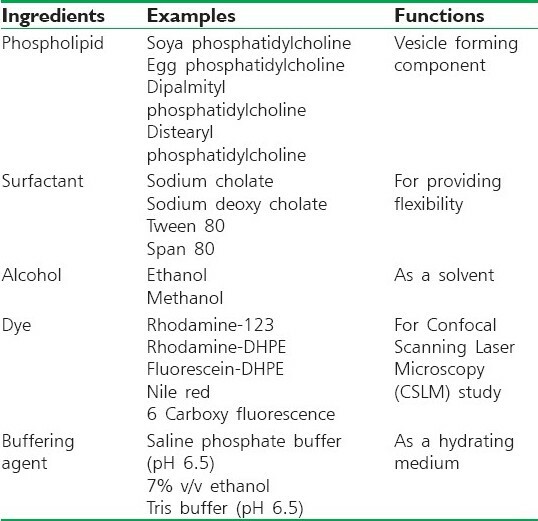 Verma P, Ram A, Jha AK, Mishra A, Thakur A. Phosphatidylcholine: A revolution in drug delivery technology. Int J Pharm Sci Res 2010. 11. Jain CP, Vyas SP, Dixit VK. Niosomal system for delivery of rifampicin to lymphatics. Int J Pharma Sci 2006;68:5758. 12. Chien YW. Novel drug delivery systems. New York: Marcel Decker Inc; 1982. p. 149-215. 13. Nanda A, Nanda S, Dhall M, Rao R. Transferosomes - A novel ultra-deformable vesicular carrier for transdermal. Drug Deliv 2005;5:395. 14. Chuanping N. College of pharmacy liaoning medical university. preparation and study on properties of ibuprofen transferosomes. J Math Med 2010. p. 2. 15. Shen Y, Zhang Y, Liao Ming. Preparation and quality evaluation of drug loading transferosomes. Med J Chin People's Liberation Army 2007. p. 10. 16. Duangjit S, Opanasopit P, Rojanarata T, Ngawhirunpat T. Characterization and In vitro Skin Permeation of Meloxicam- loaded liposomes versus Transferosomes. J Drug Deliv 2011;5:207-14. 17. Cevc G, Blume G. Lipid vesicles penetrate into intact skin owing to the transdermal osmotic gradients and hydration force. Biochem Biophys Acta 1992;1104:226-32. 18. Jain S, Jain P, Umamaheshwari RB, Jain NK. Transferosomes: A novel vesicular carrier for enhanced transdermal delivery: Development, characterization and performance evaluation. Drug Dev Ind Pharm 2003;29:1013-26. 19. Benson HA. Transdermal drug delivery: Penetration enhancement techniques. Curr Drug Deliv 2005;2:23-33. 20. 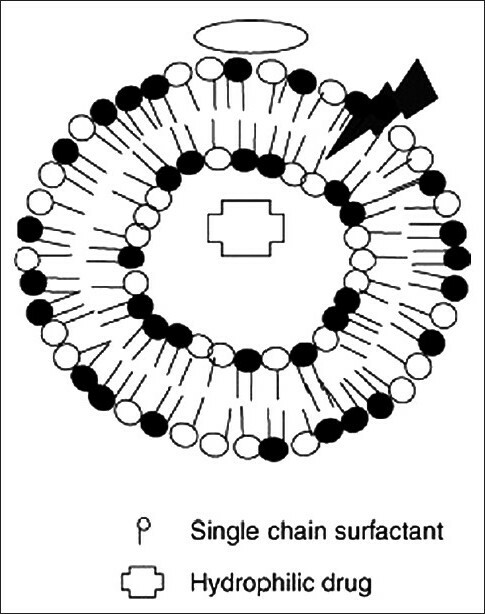 Maurya SD, Agarwal S, Tilak VK, Dhakar RC, Singh A, Maurya G. Enhanced transdermal delivery of indinavir Sulfate via transferosomes, Int J Compr Pharm 2010;1:1-7. 21. Sheo DM, Shwetha A, Ram CD, Ghanshyam M, Girish K, Sunil KP. Transferosomes - A novel vesicular carrier for enhanced Transdermal delivery of stavudine: Development, characterization and performance evaluation. J Sci Speculations Resea 2010;130-6. 22. Patel R, Singh, Singh S, Sheth NK, Gendle R. Development and characterization of curcumin loaded transferosomes for transdermal Delivery. J Pharm Sci Res 2009;1:271-80. 23. Pandey S, Goyani M, Dev MV, Fakir J. Transferosomes: A novel approach of transdermal drug Deliv Sch Res Libr 2009;1:143-50. 24. Boinpally RR, Zhou SL, Poondru S, Devraj G, Jasti BR. Lecithin vesicles for topical delivery of diclofenac. Eur J Pharm Biopharm 2003;56:389-92. 25. Cevc G. Material transport across permeability barriers by means of lipid vesicles. R. Lipowsky, E Sackmann (Editors.). Handbook of physics of biological systems. Vol. 1. Amsterdam: Elsevier; 1995. p. 441-64. 26. Singodia D, Gupta GK, Verma A, Singh V, Shukla P, Mishra P, et al. Development and performance evaluation of amphotericin B transferosomes against resistant and sensitive clinical isolates of visceral leishmaniasis. J Biomed Nanotechnol 2010;6:293-302. 27. Jain S, Umamaheshwari RB, Bhadra D, Tripathi P, Jain P, Jain NK. Ultra deformable liposomes: A recent tool for 78okffective transdermal drug delivery. Indian J Pharm Sci 2003;65:223-31. 28. Barry B. Transdermal drug delivery. In: Aulton EM. (editor). Pharmaceutics, The science of dosage forms design, 2nd ed, Churchill Livingstone, Newyork: Harcourt Publishers; 2002. p. 499-33. 29. Cevc G. Transfersomes, liposomes and other lipid suspensions on the skin: Permeation enhancement, vesicle penetration, and transdermal drug delivery. Crit Rev Ther Drug Career Syst 1996;13:257-388.